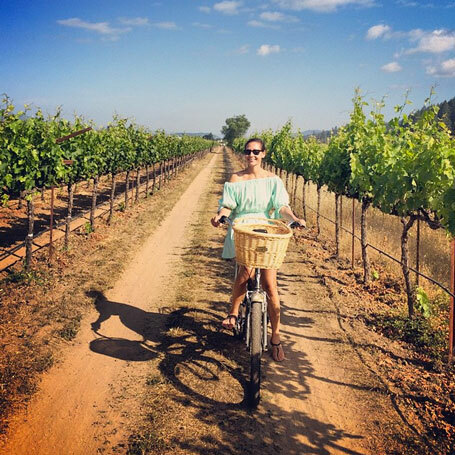 My Memorial Day weekend kicked off with bike-riding through Napa vineyards and ended with backyard barbecuing in Malibu! In between, I paraded around in some fun new dresses, such as the Pixie Market off-the-shoulder, above, and the Heidi Merrick back-baring show-stopper, below. Now that dress season is officially here, I'd like to continue parading around in this Proenza Schouler (on sale!) this 3.1 Phillip Lim (on sale! ), this Isabel Marant (on sale! ), this Sophie Theallet (on sale! ), this Lover (on sale! ), this Christophe Sauvat, this Rachel Zoe, and this H&M. P.S. The sale situation at Bergdorf Goodman is seriously bananas (replete with Proenza, Stella, Chloe, et al). Netaporter's half-off sale is also on and definitely worth checking out. Be sure to hit Matches, too! Love both dresses...the look great on you! Wish the mint one was still available. Could you let us know how sizing runs for the Heidi Merrick dress? The dress runs big. I'm wearing a size 2!